Greetings from this Growler Girl! I want to talk to y’all frankly if I can. But first, a story. The weekend before Thanksgiving, my husband and I went insane and decided that it wasn’t cold enough in Georgia for us (just kidding, it was), so we hitched a flight up to Boston and Salem to ease our overworked minds with history and beer. As any craft beer connoisseur can tell you, a vacation doesn’t count without a trip to a local bar or brewery. So, despite the bitter wind’s resistance, we hit up Salem Beer Works, Sam Adams (of course), but my favorite of all ended up being Harpoon. Imagine walking into a bar that was the expansion of your house, filled with long German Beer Hall style tables and what seems to be endless taps. Add some fresh baked spent grain pretzels and good people, and you’ll understand the little beer nirvana that is a Harpoon Brewery visit. One of my favorite aspects of drinking at Harpoon was that while waiting for your tour to start, you could sit in the beer hall and order a pint. Stop. Rewind. You could sit in a place that brews beer and BUY a pint! Why is this so amazing? I’ll get to that in a bit. The tap line-up was huge and included beers from their year round collection, all of their seasonals (in November!) as well as some experimental batches, which was something fun that Sam Adams and Salem Beer Works did not offer. So, of course, I went straight for the experimental stuff because Harpoon is pretty widely available in Savannah. One of them was fabulous, while the other was experimental for…clear reasons. Fear not readers, for I soldiered through to another pint. And after the tour (which included unlimited sampling in a tasting room full of cool vintage American beer cans), when I was bloated and happy, I momentarily got sad thinking about the cool beers available here that I would never get to drink again. Oh wait. This is tales of the Traveling Growler. Available in natural Stainless Steel, midnight black, or rustic copper finishes. The secure Swing Top lid will keep your beer fresh. 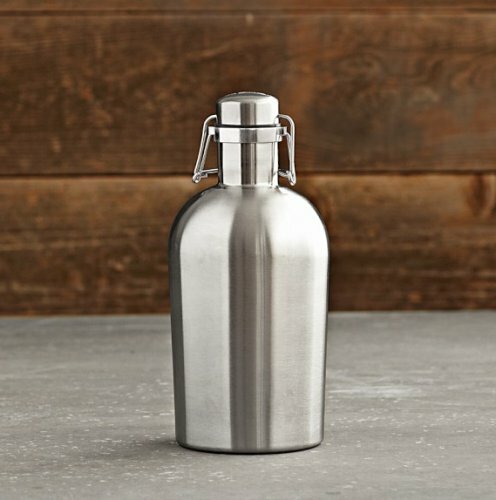 Great for transporting beer, water, or any other cold beverage! This Is a 2-liter Nostalgic Green Beer Growler Homemade Beer Bottle Brewing Supply! Theses Beer Bottle Glasses You Can Start Enjoying Drinking! They Include with a Flip-top Lid and Metal Handles! It Is Perfect to Bring a Beer Bottle Home From a Pub! !